Tonight is Round-up night where we will be officially kicking off the scout year and enjoying some refreshments! We will also be working on the Athlete Activity Badge at the Catty Park testing our abilities in: curl ups, pull-ups, push-ups, long jump and running. This requirement requires the scouts to show their progress over 30 days so be sure to record your progress over the next month. 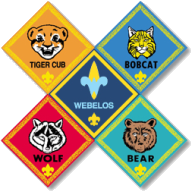 We will also be discussing our primary scouting fundraiser, popcorn, with both the Akela’s and the scouts. There are several upcoming show and sell opportunities so be sure to go on the website and sign-up!